The Wednesday List Lynx still prowls the office here after dark. Welcome to this week’s link list to those of you who didn’t already have it automatically download to their phone. T.D. Jakes has two syndicated television projects in development, one a daily show, the other a weekly. At age 14, she was taken from her family and given to an ISIS commander as a bride. Then she and a friend escaped. Pope Francis shook things up last week by performing weddings for couples who had been previously living together, some of whom had children. …But one church planter thinks the move by churches back into cities like NYC is somewhat selective when it comes to neighborhoods. A few like-minded linkers this week noted this upcoming theology cruise to the Eastern Carribean. Beats a seminary classroom, I suppose. Maybe you were predestined to see this. What if instead of suppressing belief in God, the 1960s had brought God into the foreground? The death of controversial pastor turned politician Rev. Ian Paisley elicits stories from The New York Times and UK Christian media. Let’s talk about a Rob Bell book before it’s released; nobody’s ever done that before. The book, coauthored by wife Kristen deals with egalitarian marriage. Your mileage may vary: See if you agree with this assessment after the lyrics of modern worship songs are placed under the microscope. Maintaining a distinct identity: What distinguished the early Christian community from their surrounding neighbors? A Georgia pastor who delivered what he considered an ‘educational’ message about the middle east temporarily had his YouTube account suspended. Planning weekend services: Living between the tension of following the template or starting from scratch. The hometown mainstream media continue their coverage of things at Mars Hill Seattle. Church Profile of the Week: A look at Christ Redeemer Episcopal in Milwaukee, where community trumps dogma, and former Evangelicals discover Anglican worship. …Taking that to the next level, a guide to having crucial conversations. You’ve seen books like All the Men of the Bible and All the Miracles of the Bible. This blog post looks at all the suicides of the Bible. Patriarchy and clergy libraries: Hey, pastor; take a minute to scan your shelves and compute the male-female balance of writers on your shelves. A Brazilian soccer star is trying to bring visibility in that country regarding the plight of Saeed Abedini, imprisoned in Iran for two years. Three book reviews, including Marketing Like Jesus and a revival of the True Love Waits movement. An atypical story of domestic abuse: When the husband is physically injured. Often voiced: Christian Bible study resources for women tend to be too feeling-based. Mathematics Department: Unpacking Baptist attrition rates. James MacDonald apologized on the weekend for a church disciplinary action against three former elders that was excessive. When Hollywood got it right: Eight reasonably positive portrayals of Christians on broadcast television. I think in many respects, the blog platform tumblr is a mission field, so I greatly admire people doing ministry there. When it comes to understanding the Christian publishing market in Canada there’s one guy you might want to know. Advertising by a faith-based preschool is refused by Groupon. Cartoonist David Hayward’s cartoons can make your head explode. Worship Leader Trauma Center: Dealing with your church’s OPH problem. After its first hiatus in eleven years, The Drew Marshall Show Canada’s “most listened-to spiritual talk program” returns to the air on Saturday. Join listeners from around the world live between 1:00 and 5:00 EDT. Calminianism: Harmonizing predestination and free will with God’s sovereignty. The Gaithers Claim Another Victim: The founder of the Christian rock band Starfield turns bluegrass. Did you get your free U2 album? Did you want to get the new U2 album? Some people were unwilling recipients. At Rolling Stone, a track-by-track guide to all eleven songs. Prosperity Gospel? Yes, people still teach that. If I’m not wealthy, I must be doing something wrong. My wife makes these. 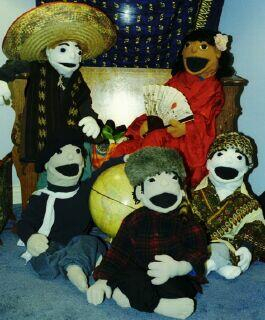 I didn’t have a closing photo this week, so I thought you’d enjoy seeing the puppets in an international mood. Paul Wilkinson failed to find a suitable Christian media link related to tomorrow’s historic separation vote in Scotland, but you can read him the rest of the week at Thinking Out Loud or devotionally at Christianity 201.